Aventures de Koam Nutrikéo (France), Nutrikéo (France), 2017 Play it Now ! Malkroz, a great wizard rebelled against the kingdom of Nutriland where he bewitched the king and spread the food imbalance on all the inhabitants, who no longer have the form. Koam, a sorcerer's apprentice, will have to face him and fight the monsters in his service to restore the good habits of each one. In this serious game, it is the surfer who will take the role of Koam in search of the elements that will allow him to restore the balance of food. He will have to collect cards and will learn, by the same, the different food groups. 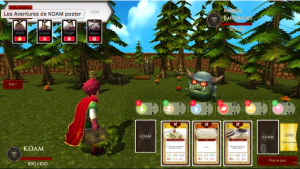 This serious game aims to introduce the player to food basics for a better balanced diet.